To learn more about Australia, and how your company can grow in this market, attend our informative series on Doing Business in Australia. This event has concluded. 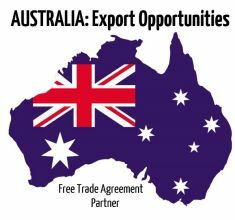 For more information on doing business in Australia, or participating in the 2017 trade mission, please contact us at 205-348-7621. Australia has proven to be an appealing and profitable market for American companies for many years. It offers very few barriers to entry, a familiar legal and corporate framework, and a sophisticated – yet straightforward business culture. While it is important to understand and appreciate Australia’s cultural differences, the long and successful history of American firms in Australia suggests that other U.S. companies will also find this market to be rewarding and attractive. Please join us in June for a “Lunch and Learn” series with guest speaker Patrick B. Fazzone. The registration form is below. Patrick is a partner at the Washington DC- based law firm Montgomery Fazzone PLLC. He specializes in sophisticated commercial transactions, corporate law, technology transfers and international trade law. Patrick has worked closely with a large number of US companies and individuals doing business in Australia and elsewhere in the Asia Pacific region in a variety of industries from oil and gas to infrastructure projects, hi-tech, manufacturing and financial services. Patrick has advised companies on the protection of their intellectual property, establishment and structuring of start-up companies, joint ventures and other commercial arrangements, contracting with the United States and foreign governments, and the drafting of sales and technology agreements. Patrick is also Chairman of the Trade and Government Committee of the American Chamber of Commerce in Australia. He focuses on providing practical and effective advice and solutions to his clients. No cost to attend. Registration is required; register below!